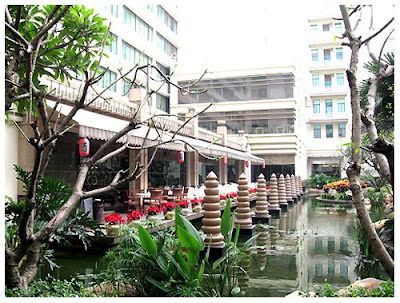 For our first two nights stay, we booked at Dong Fang Hotel (US$ 129.00 per night) with daily buffet breakfast. 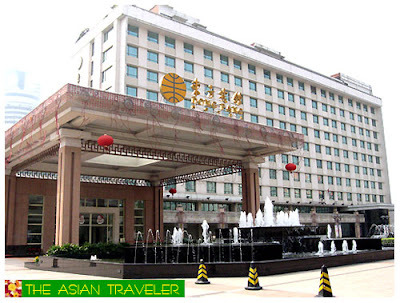 It is a 5-star hotel situated in the intersection of North Jie Fang and Liu Hua Road, which is one of the key commercial and financial districts in Guangzhou, China. 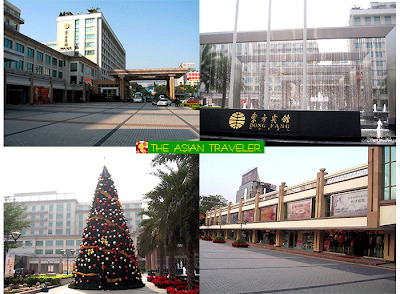 Also it is just opposite the Canton Fair Liuhia Complex. 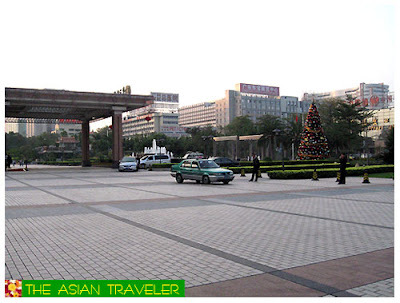 Entrance to the hotel has a large marquee and the facade is so large. It is decorated with a mix of traditional and modish touches. It offers excellent value for its location, which is only 1 kilometer from the subway station. 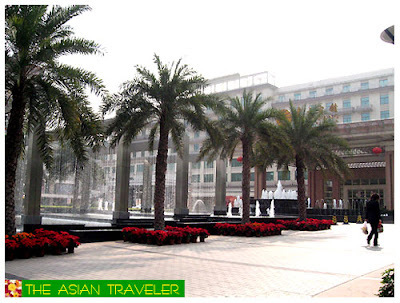 The hotel also has large conference and meeting facilities, fitness center, spa and a huge shopping arcade with some great high quality boutiques. We had a very spacious room. 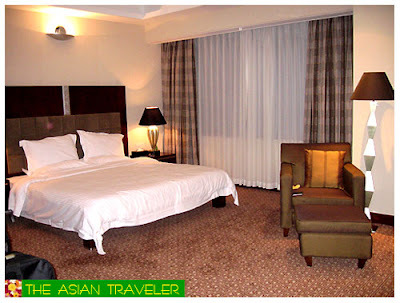 The king-sized bed was to die for with four blissful pillows that afforded us an idyllic slumber. The room was ideal, elegantly decorated and comes with modern amenities including TV with international channels, broadband internet access, electronic thermos, refrigerator, personal safe, minibar, radio and alarm clock, individually controlled reading lights, work desk with lamp, rack, single-seater sofa and bedroom slippers. I love the bathroom simplicity and sophistication. It was very clean and finished in immaculate white with bathtub, countertop basin and a separate shower enclosure. It has bathroom amenities such as bathroom telephone, fresh towels, hairdryer, shave, bathrobes and bathroom vanity mirror including complete complimentary toiletries and mineral water. 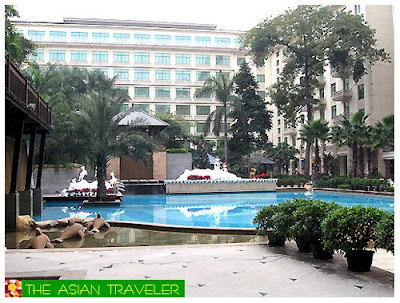 We had our buffet breakfast at Cafe More Buffet Restaurant with an extensive array of Western, Chinese and Japanese fare during our two days stay. The food was good but I didn't find the staff very friendly and attentive. When we got to the dessert bar, someone started cleaning up our table, and another guest already occupied it when we went back to our place. It was rude and downright neglectful of them. I thought how come they didn't see us. The place wasn't even half-full plus the fact that you can see every single living soul there. I was a little pissed off but I still managed to calm myself. Hubby and I demanded for another table. Nonetheless, the lady server was very apologetic about the incident. 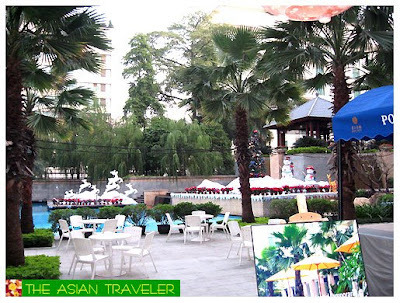 The hotel has 800㎡ swimming pool with boat bar, wavy massage chair and a large platfrom for sightseeing. The weather was cold at that time, so no one dared to swim. Adjacent to the pool is the one-hectare central garden, elegantly designed with small bridge accross a stream leading to fresh and lush semitropical greenery. I don't know if prostitution is rampant in Guangzhou. I had not seen anyone roaming around the hotel though. A few months ago I had read that some Asians, specifically Chinese women with Caucasian male partners/husbands were being falsely accused or falsely branded as prostitute. If this is true, the management should show discreet and sensible forethought in accusing someone to avoid embarrassment to everyone concerned. I just hope this is not happening anymore. But other than that, I would still recommend this hotel to anyone looking for a nice place to stay.